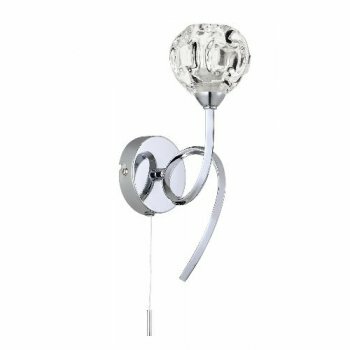 Dar Lighting Babylon single light wall fitting with a twisted arms projecting out from a circular wall plate in polished chrome and finished with an open ended crystal globe glass shade. The product code for this Dar wall fitting is BAB0750. This fitting comes complete with a pull cord switch. A striking collection of lights which also includes a 3 or 5 light ceiling fitting.